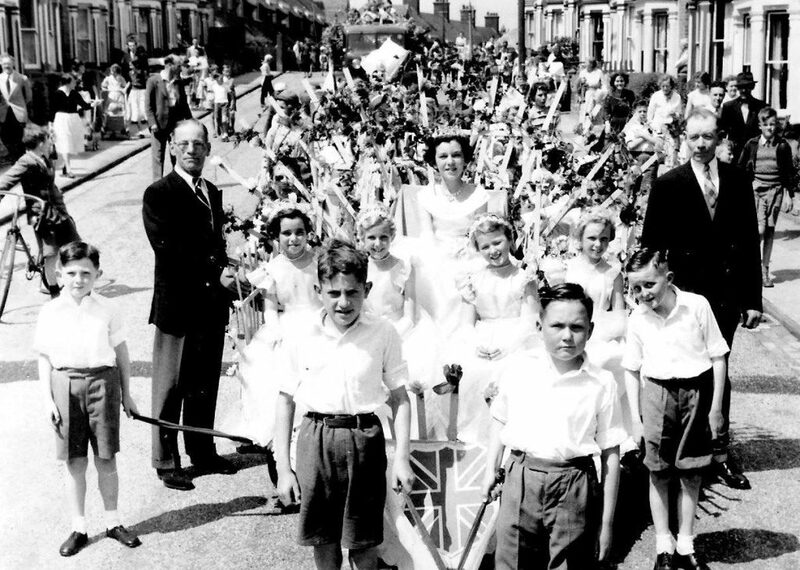 History of the Harwich & Dovercourt Summer Carnival. Harwich and Dovercourt had their first taste of carnival in 1933 and thoroughly enjoyed it. It was a sensational success from every point of view and afforded the town wonderful publicity. While brilliant sunshine poured down, thousands of people, forming a huge throng such as Harwich and Dovercourt have never before seen, line the streets for the procession which marked the opening of Dovercourt Bay’s first Carnival Week. It was a brilliant spectacle with the procession fully half-a-mile long and containing an impressive array of tableaux, decorated vehicles and costumed revellers, making its way slowly through the decorated streets, while on either side there was a sea of people. Traffic was diverted away from the route of the procession so close were the road and pavements packed, while in side streets scores of cars were parked. It was in every respect an auspicious start for the extensive programme arranged for the whole of the week, representing the culmination of many weeks on part of the organisers and their helpers, who numbered something approaching two hundred. The Harwich and Dovercourt carnival in 1933 with Miss Hilda Dowling as the first Carnival Queen and has continued off and on. 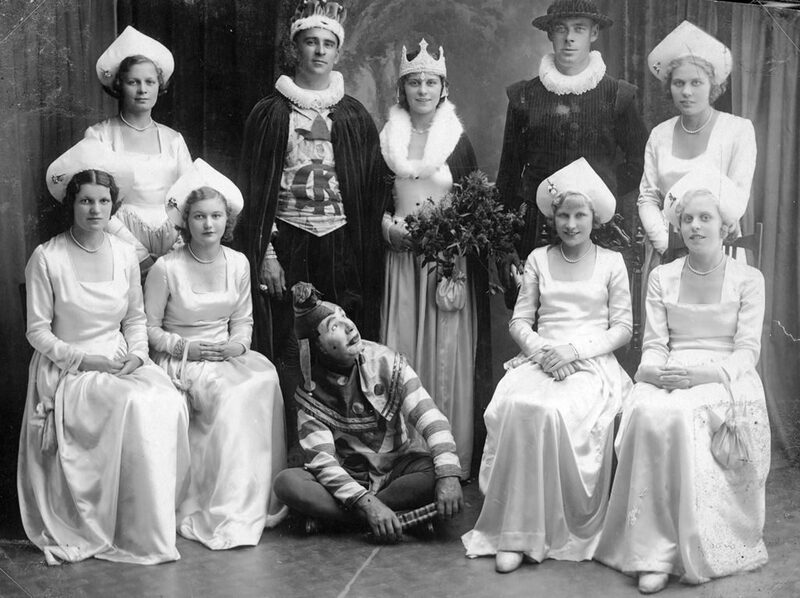 Although lacking the novelty of the first, the second carnival in 1934 was a success. Then in 1935, when arrangements were well in hand for the third carnival week, difficulties arose that made it impossible to carry on. Those difficulties had not been overcome in 1936, and it was then decided to make a special effort to hold a carnival week in the Coronation year of 1937. Harwich & Dovercourt Bay Carnival Week 1937, Costumes and Pageantry and Dancing was arranged by Mrs A.B. Kettle and Miss Ida Kettle with pupils of the Kettle School of dancing. All profits were divided among the following charities: Harwich and District Maternity Ward Scheme, Harwich and District Tuberculosis Care Association, Harwich and Dovercourt Boy Scouts Local Association, Harwich and District Hospital, Harwich St. John Ambulance Brigade. The Mayflower. The Mayflower, which created so much interest when it made its first appearance in the first Carnival at Dovercourt in 1933, was again on show. This large ship which had such a close connection Harwich originally the work of the staff of Messrs, Fisher and Wood and later presented to Harwich Corporation, was entered by the borough surveyor’s department of Harwich Corporation under whose supervision it has been prepared for the Carnival. The Stone Pier Tiddler. A massive fish alleged to have been caught in Dovercourt Bay, was the work of the staff of Messrs. J.A. Saunders, Ltd, of Dovercourt, and this also attracted Much attention. “The Dart Inn”, a two-sided tableau representing the interior and exterior of a country inn with be smocked yokels and bearded landlord of ample girth. This was entered by “The Standard” Printing and Publishing Co.
Harwich and Dovercourt has been making one of the biggest efforts it has ever known on behalf of local charities. In glorious weather, the 1938 Carnival Week has been launched after many months of preparations with the avowed object of raising funds for local charities, in contrast to previous carnivals which have had as their objective the advertising of the town as a seaside resort, although last year it was agreed that the profits should go to charity, and in all a sum of £1,00 from carnival funds was distributed. A company of nearly two hundred attended the dance at the Alexandra Hall, Dovercourt, on Wednesdays, when the final selection of “Miss Carnival 1938” from the five finalists selected at a previous dance was made. The selection was made by public ballot and the choice fell on Miss Priscilla Smith, Waddesdon-road, Dovercourt. During the evening, the five finalists, Miss Joan Felgate, of Parkeston, Miss Evelyn Green, Miss M. Hill, Miss Eleanor Rider and Miss Priscilla Smith, of Dovercourt, were introduced from the stage and paraded round the hall. Mr. C.J. Lamb was M.C. and when the result of the ballot was announced “Miss Carnival 1938” was presented with a bouquet by Dr, K. Phelan, the chairman of the Carnival. 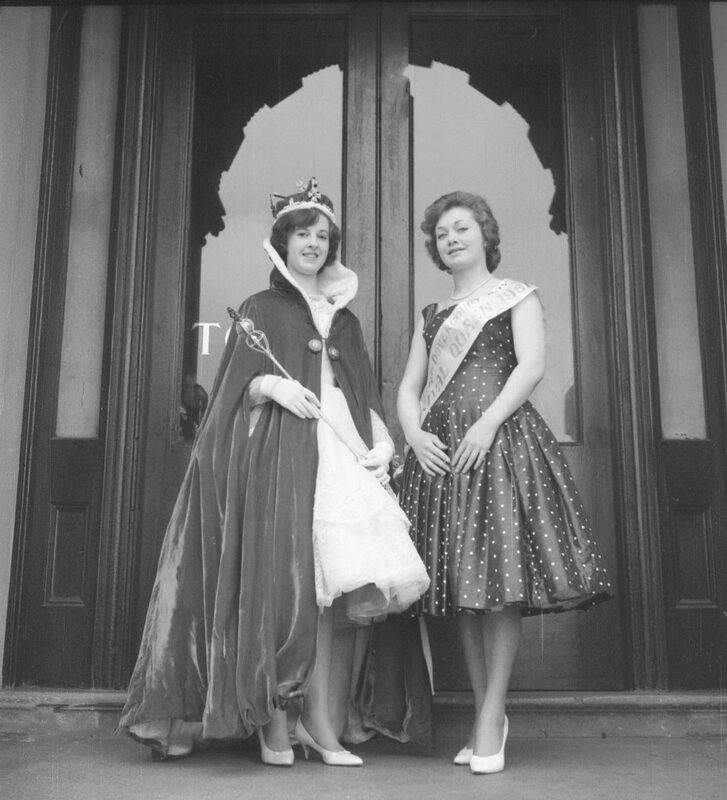 Leaving her post as cashier of a Dovercourt grocery store for a day, 18 year old Patricia Clover of Garland Road, Parkeston presided over the Borough’s Festival Carnival, held on the 18th August 1951, as Carnival Queen. Her ladies-in-waiting were Miss Joyce Cook and Miss Barbara Jones. 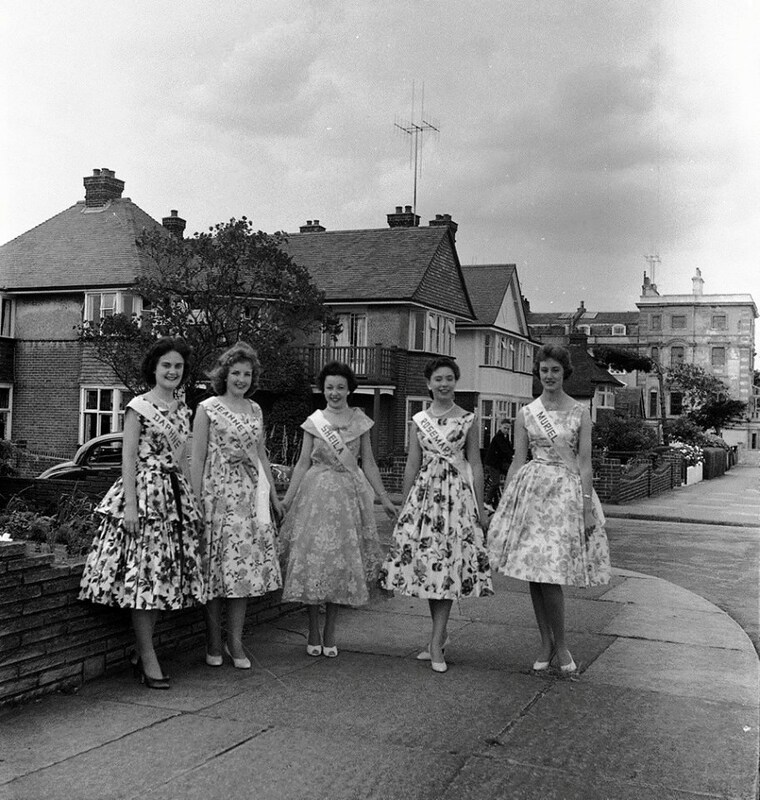 Selected from ten aspirants to the title as a dance at the Cliff Pavilion, Dovercourt. After a dull start, a day of brilliant sunshine followed, starting with the crossing of the line ceremony at the Quay which was supervised by Lieut. Commander Read of the Reserve Fleet. Thousands of people, many in fancy dress, watched the landing of King Neptune, who was an officer from Ganges, and his court. He was welcomed by the Mayor and Mayoress (Alderman & Mrs E Gant) and their party. The two ‘official’ prisoners were Chris Bell and Leonard Gosling, a local sweep, who were found guilty of various charges and, along with other victims, underwent traditional the traditional ducking in a special tank. After ‘crossing the line’ King Neptune, was escorted to the steps of the Town Hall by the Mayor, where he crowned the Carnival Queen, Miss Pat Clover, and escorted her an her attendants to their car. A shower of balloons and streamers were released by Mr Brown of the Quay Pavilion. The carnival procession included nearly forty entries and eventually halted at the ‘Elco’ café on Marine Parade, loaned for Carnival Headquarters by Mr John Elliott. The marshal for the procession was Mr Bob Starling, on a black horse, followed by the original Pearly King and Queen with their son from Southwark, in a pony and trap. 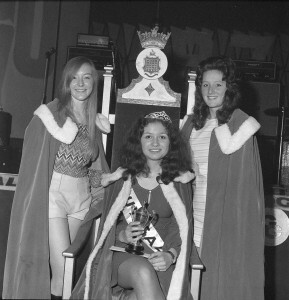 The carnival Queen presented prizes to the winning floats and afterwards she and her attendants, with the judges, were entertained to tea at the Alexandra Hotel by the Mayor and Mayoress. Parkeston’s first summer carnival in 1956 was to provide the village with more and better equipment for their recreation ground, proved a great success when thousands of people went to the Welfare Park to watch the carnival and wander amongst the many side shows at the fete which followed. Leading the procession was the carnival princess, Susan Harvey, who sat on a picturesque float, accompanied by her attendants, Melanie Castle, Carol Gray, Sheila Rose and Susan Howlett. 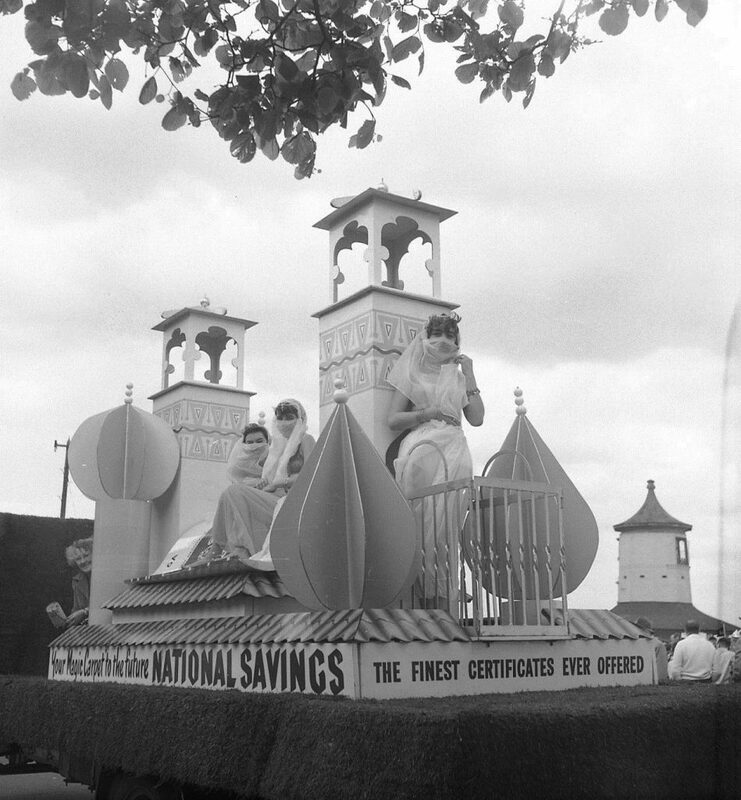 The fete had a great deal to offer the amusement seekers, including aerial rides for the children, coconut shies, donkey rides and all the usual fete attractions. The “Sewer Monster” was put to good use, when fete-goers were invited to mark the spot where his dimple was. 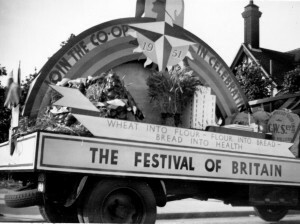 In the 1959 Summer carnival, nearly 40 floats took part in the procession from Harbour-crescent and then to Dovercourt High-street, then the procession went via Main-road to Upper Dovercourt War Memorial, returning by way of Fronks-road, with a ten minute stop at the Grange, and then via The Drive and Lower Marine parade to Retreat Grounds. Jazz Band. Providing a different type of music to other bands in the procession and adding more to the gaiety was the traditional jazz band of the Imperial College of Science and Technology, London University. Drummer in the band was local university student Michael Smith, of Dovercourt. 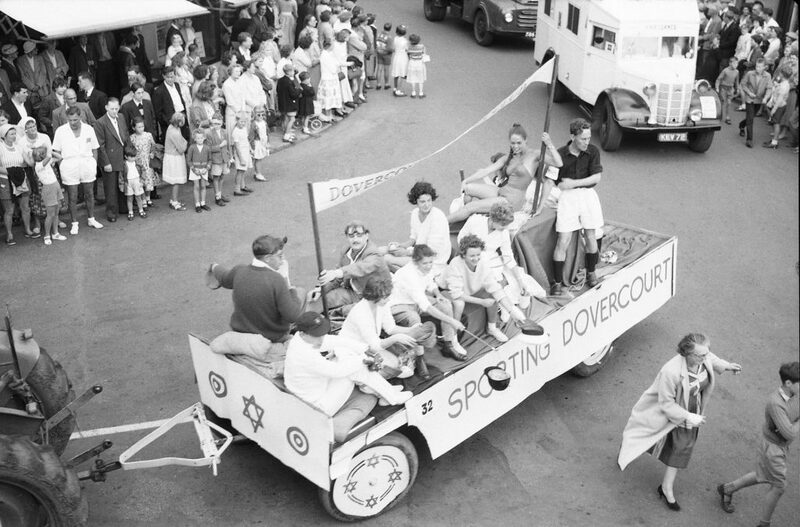 “Sporting Dovercourt” was the title of the float entered by Dovercourt Sports Club, the members being dressed to represent all the different types of sports to be found locally. These included cricket, tennis, football, golf, swimming and horse riding. Entry by the Orwell Guest House was entitled “Room at the Top” where in fact there appeared little for a rare assortment of about eight “guests” were sleeping in one bed. Every facility was given them throughout and there seemed to be a few complaints with these “digs”. The Carnival Girls. Pleasing feature of the week was the presence of the Five Carnival Girls at each of the events, Chosen from among a crowd of girls nominated by local organisations, the girls have added a touch of charm and beauty to the occasion, without the false glamour of a “beauty queen” and on all sides there has been praise for their good work. The five girls are the Misses Daphne Dale, Muriel Hudson, Jeanette Fletcher, Sheila Randall, and Mrs Rosemary Beetschen, formally Miss Naylor, whose marriage took place since her selection as a Carnival Girl. Crowds of more than 700 filled the spectators’ accommodation at Dovercourt skating rink, when the carnival programme presented by the local Roller Hockey and Dance Club was generally voted one of the best efforts by the club. Disappointing though it was that torrential rain brought the 1960 summer carnival procession at Harwich and Dovercourt to a sudden end after completing little more than half the route, the procession, highlight of the carnival week festivities, was itself no disappointment for the standard of the tableaux was again very high. Dark clouds were gathering ominously in the sky before the procession moved off from Harbour crescent, but the rain held off until the presentation of the trophies had been carried out in the forecourt of Phoenix Hotel, Dovercourt. Heading the procession once again were the now famous Marine Shops Band and “big heads” and without them no Carnival would seem complete. “Moscow Delights” was the title of the tableau entered by British Railways, Parkeston Quay, the theme being the recently inaugurated service from London to Moscow via Harwich and The Hook of Holland. The very good replica of a railway coach had been built by railway employees in their spare time and had taken about a fortnight to complete. The passengers included some charming Russian girls dressed in red costumes and white Cossack-style fur hats, two spies and “other distinguished personnel of M.I.5. Two open landaus carried the Carnival King and Queen Andrew Willats and Kathleen Griggs, and the queen’s attendants, Patricia Thorne and Patricia Manville. It would have taken more than a million or so greenfly to spoil the enjoyment of Harwich regatta and water carnival, which was organised by the Harwich Town Traders’ Association. As it was, the greenfly descended in hordes on the onlookers, but the fun of the carnival held sway, and to prove it the large crowd which gathered on Harwich Quay early in the afternoon was still there at 11 p.m. when the fireworks finished. The event was notable for the splendid spirit of a few men and women of the town, who set out to give carnival entertainment and made the grade all the way along the line, both from the organising and the actual fun of the event. The parade of boat floats caused a laugh. Boys of the Sir Anthony Deane School, made up as dark-skinned warriors, paddled a war canoe. There was also a clever entry by the Harwich Sub Aqua Club of the skin diver and the mermaid. Both these floats were well and truly soaked by buckets of water from other boats in the procession. Harwich and Dovercourt Bay Carnival Week in 1961 got off to a wonderful start on Saturday with the regatta and water carnival in The Pound at Harwich, organised by Harwich Town Traders’ Association. The programme spanned some eight and a half hours and throughout that time hundreds of people thronged the quayside and it was estimated that the crowd was always about 5,000 strong. 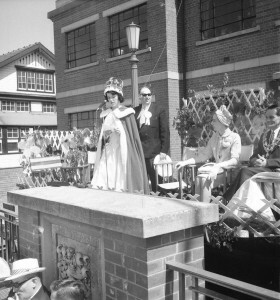 The programme began with the crowning of the Carnival Queen by the Mayor, Councillor S.C. Simmons, who was accompanied by the Mayoress. The ceremony was performed on an “island” complete with palm tree and “native” girls dressed in grass skirts in the centre of The Pound. The Queen, Miss Eileen Garnett, was dressed in white, Miss Joan Bennett in pink and Miss Roberta Chapman’s dress was of a floral print. 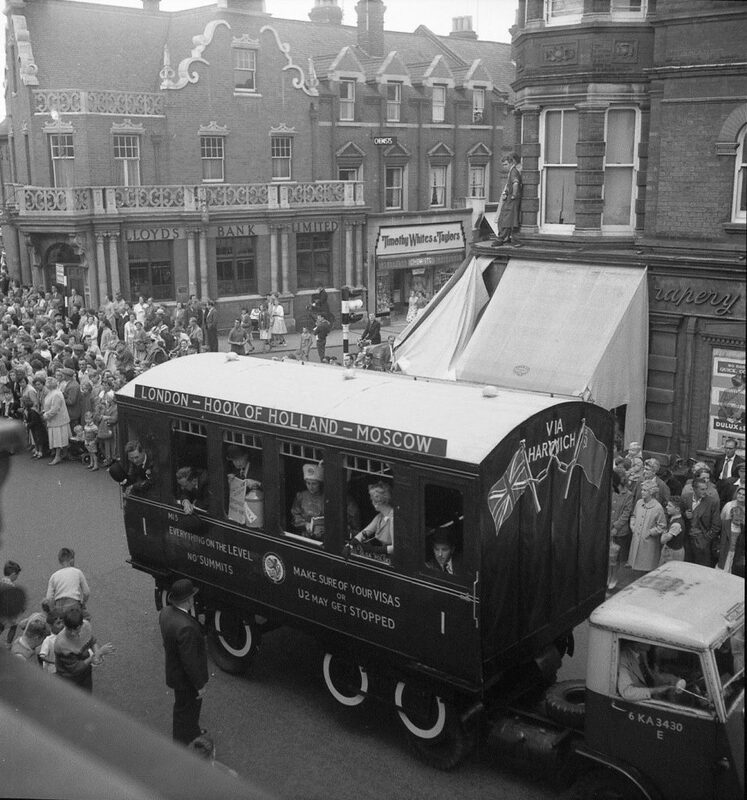 The opening of the Harwich Carnival in 1962 with the water carnival and regatta coincided with an extra-large slice of summery weather. In fact it was the finest weather for many years, and hundreds of people flocked to Harwich Quay to see the fun, which lasted from early afternoon until late at night, when it was open air dancing. 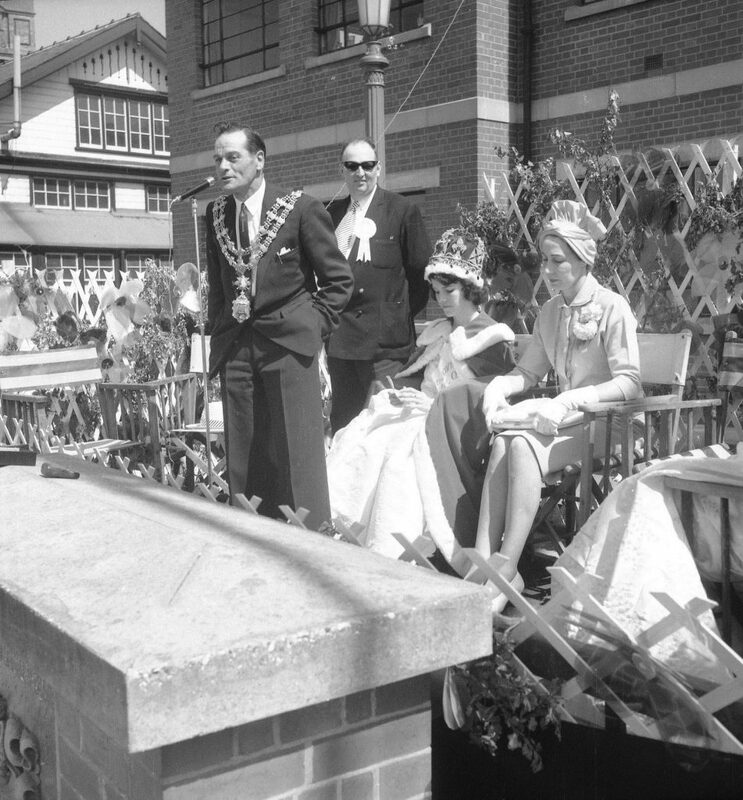 Mayor of Harwich, Councillor S.C. Simmons, opened the carnival week from the quayside, with him were the Mayoress, Mrs Simmons: the Carnival Queen Miss Dorothy Short, and her attendants Miss Valerie Chilver and Miss Shirley Tedder. The Mayor reminded the crowds that they could enjoy carnival fun at Harwich and Dovercourt for eight days. Most towns, he pointed out, had only a day or week-end carnival. A great effort had been put into the arrangement by the carnival committee. A record crowd attended the mammoth 1963 Bank Holiday Carnival fete at Barrack Field, Dovercourt. The twelve events in the main ring packed thousands into the fete. A small crowd was already on the field in the morning when the Carnival Queen, Miss Rita Van Dam, performed the official opening ceremony. Entries this year were at a record high figure of over 150 and besides representatives of Frinton, Mistley, Ramsey and Wick far, riding schools, there were many private entries. Twelve hours of non-stop entertainment once again paid dividends when a record crowd attended the mammoth Bank Holiday Carnival fete at Barrack Field, Dovercourt. The twelve events in the main ring packed thousands into the fete, while colourful stalls made more money than ever before. Harwich and Dovercourt Summer Carnival 1964 got off to a swinging start when the Mayor, Councillor H. Gochin, officially opened the event at a dance in the Cliff Pavilion. Also present were the Mayoress, Mrs Mary Gochin, the Carnival Queen, Miss Ruth Higham, and her two attendants, Misses Eileen Mixter and Patsy Keeble, and also Simon Dee, disc jockey on Radio Caroline, visiting Dovercourt for the weekend. In opening the carnival, the Mayor commented I hope you have four days of fun in the borough” And give generously as the proceeds are to go to charity.” A week-long summertime festival of fun and games for the small seaside town of Dovercourt, Essex. Taking advantage of their coastal location participants compete on sea as well as land, testing their strength, agility and good sportsmanship with a range of traditional and less traditional activities including ‘sack battles’ on or over the water – not an easy balancing feat that’s sure to end in a Dovercourt Bay dunking. 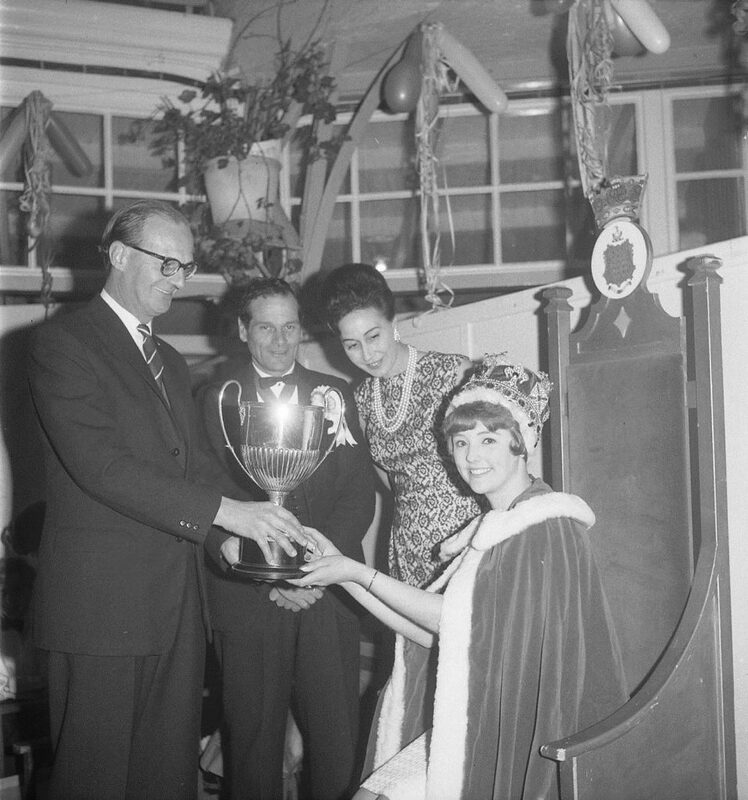 The 1965 Carnival was officially opened by the Carnival Queen Miss Margaret Crisp at a show at Dovercourt Skating Rink, which included displays from two British figure skating champions. Present at the opening ceremony were the Mayor and Mayoress, Councillor and Mrs E. Newton; the deputy Mayor and Mayoress, Councillor and Mrs H. Gochin; and the two attendants to the Carnival Queen, Miss Suzanne Rowland, who wore a full-length place blue brocade dress, and Miss Theresa Honeycombe, who wore lemon brocade, and the Carnival princess, Miss Margaret Crisp, dressed in full-length white satin brocade dress, thanked all committee members who had worked hard during the winter months. Highlight of the Carnival Week Bank Holiday fete, at Harwich Green was undoubtedly a moto-ball match between Harwich Stour Valley and Ipswich Triangle motor-cycle clubs. Unfortunately the Harwich teams were defeated 3-0 by the Ipswich champions, but not before the large crowd had been entertained with plenty of spills and excitement. 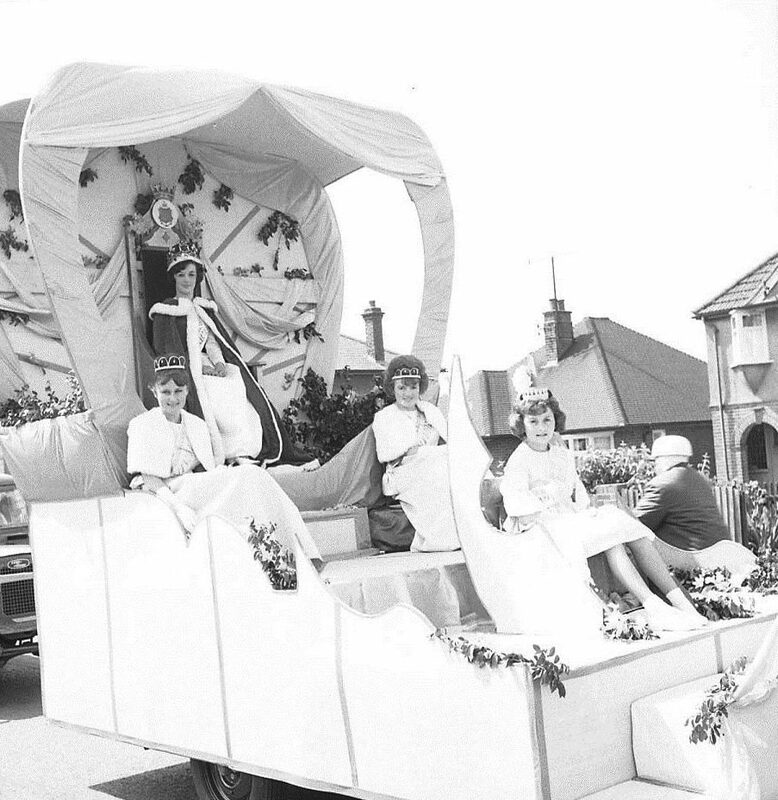 The 1978 Carnival began with a vengeance and the break in the weather came at precisely the right time for the organisers of the Harwich and District Summer Carnival. The sunshine brought the crowds on to the kerbsides to watch the carnival precessions led by the Marine Shops band and the bigheads. In all the procession included four bands and majorettes, 13 floats, six visiting carnival queens, the Parkeston May queen and two carnival courts. 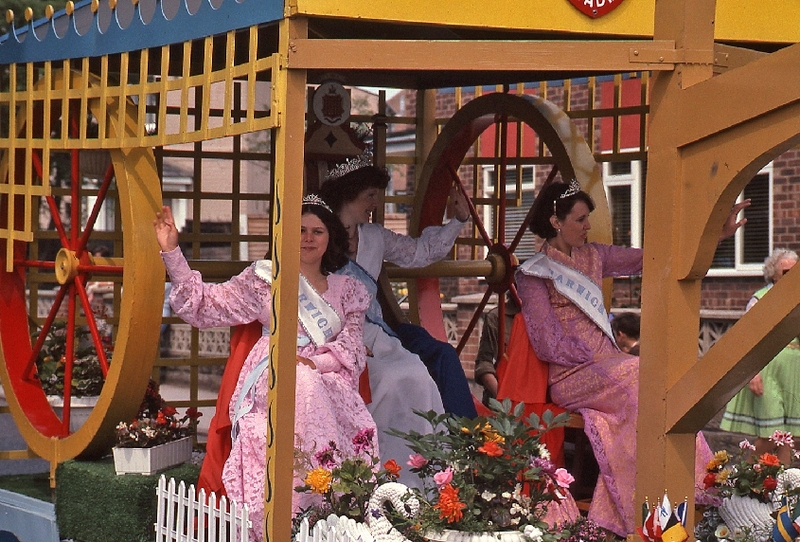 The Harwich Carnival queen Jean Hoare was paraded on a new float, specially built for the occasion, featuring the Harwich Treadwheel Crane. Prize-winners for carnival floats presented by Mayor Mr Jeff Spall, were Class A commercial. 1 Captain Wines Ltd; 2 Pier at Harwich; 3 Stourwood Garden Centre. Class B works social clubs, 1 Norprint Square Roots; 2 Port Workshops. Class C private clubs, 1 Bernards; 2 Luney Club; 3 Cliff Road youth club. 3 Caroline Allen as Fairy Rosebud. 3 Rebecca Blesset as Witch. Pairs: 1 Paul and Stephen Eastwood as Oil Slick; 2 Marie and Tina Thomason as Clowns. Acknowledgements: The Harwich Society, Harwich and Manningtree Standard.